The Austin Convention Center (ACC) hosts some of Austin's largest events in the heart of downtown Austin. Palmer Events Center, its sister events space, is situated across Ladybird Lake and hosts inventive parties and meetings, often coordinating with larger events at ACC. ACC and Palmer partnered with the Design, Technology, & Innovation Fellows to reimagine their web experience for event planners and collaborators. Research began with a deep dive into event planners daily routines. We interviewed them to learn what they valued and needed from an event space website. We also interviewed coordinators to learn how information was collected from planners then distributed to exhibitors and attendees. We also took time to get to know the needs of our partners and how they built relationships with partners and planners. Throughout discovery we interviewed 31 event planners, coordinators, exhibitors, attendees, and the ACC and Palmer teams. After wrapping up interviews, we synthesized people's stories and observations into new learnings. Advisory team members from ACC joined us during synthesis to learn about our process. They also provided context and subject matter expertise that helped guide design. 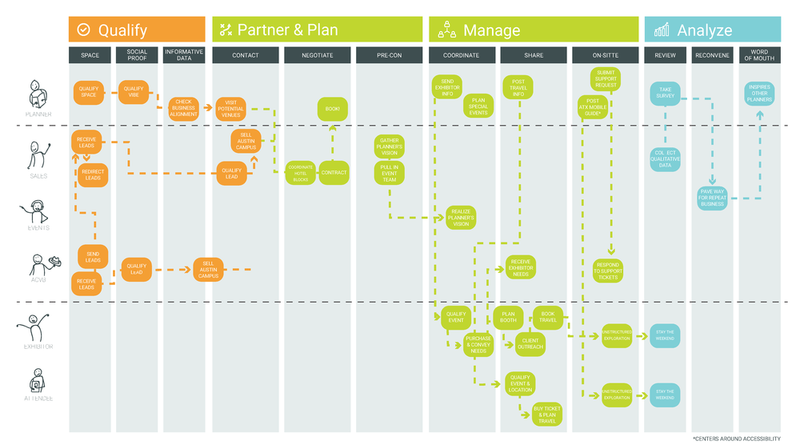 RFP Submission is a roadblock to relationship building and workflow for planners and staff. Planners can't access important information quickly enough to do their job. 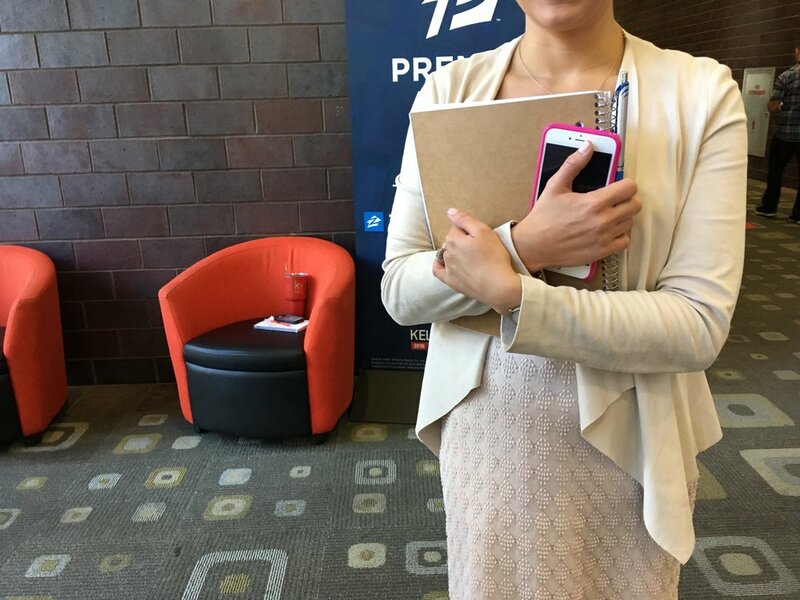 ACC attendees plan restrictive schedules then come and go before ever getting to know Austin. Planners thrive on collaborative city networks but ACC and Palmer struggle to visualize their rich Austin network. There's more to ACC than booking hotel rooms but the community at large struggles to see it as more. HMW transform 'booking an event' into a conversational prompt? HMW provide self-reliant planners the information they need, when they need it? HMW promote ACC & Palmer's collaborative city network? HMW welcome attendees to more of Austin and entice them to stay longer? HMW position ACC and Palmer as collaborative reference points within the Austin 'campus'? I created a journey map, layering observations over a timeline which details the many people required to have an event, and how and when each person needs to provide or access specific information. Discovery: planners need obvious and reliable organization for their constantly shifting goals and wide range of information gathering. Being able to quickly access info, they can qualify event spaces, plan their event, execute tasks, and analyze outcomes–independently. Collaborate: planners and sales team members need to be able to 'get on the same page' during quick calls or over email. Sharing photos, event planning progress, and celebrating are all part of collaborating to produce innovative events. Explore: a smaller portion of content will be curated for Austin visitors including event attendees and exhibitors. We audited the existing ACC website content, identifying depth and types of content. Audrey Moon, the lead Visual Designer on the project, conducted a competitive analysis that, along with the content audit–helped us select the appropriate content model for the new site. We generated over 60 concepts that addressed the opportunities. We prioritized them and moved into sketching out user scenarios that would help us put the user in first person. Writing or drawing out a user scenario helped us move from concepts to user flows. We wrote scenarios, putting planners in the first person and began fleshing out some of the interaction details. In each scenario the planner accomplished a goal such as finding the correct square footage for a meeting room. 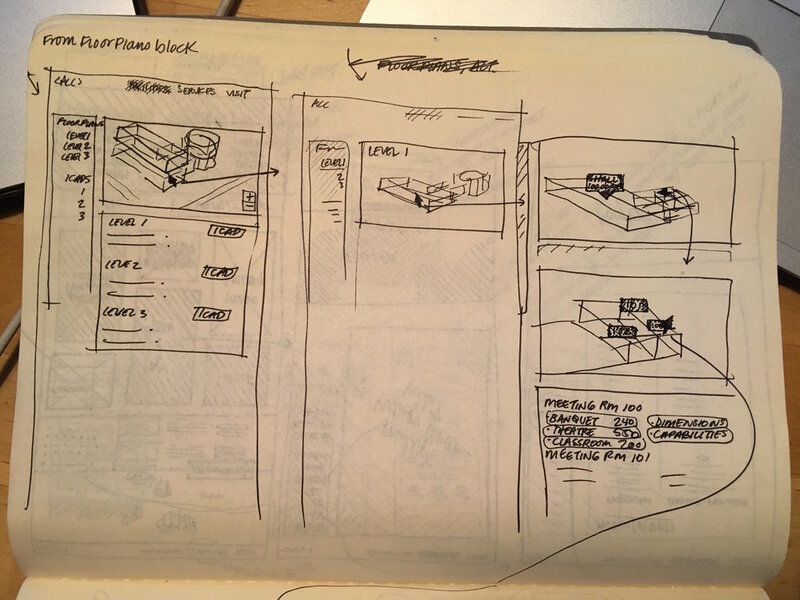 Storyboards propelled us into more refined wireframe flows. That allowed us to begin testing the flows in-person as well as remotely using InVision and Lookback.io. Usability test sessions revealed flaws and wins and help us to iterate quickly. This flow shows a person leaving the homepage and going directly to floor plans to look for room dimensions. Earlier exploratory work is below.